The headline of this post is an example of a misplaced modifier (more specifically, this one is a dangling participle). Misplaced modifiers pop up every day, and even though it’s often clear what the writer meant, they cause a little stumble — and occasionally major confusion — for the reader. Why it’s wrong: When you “back into” a sentence with a phrase, the information in that phrase goes with the subject of the sentence. So here, the “having started this post” goes with “an idea,” which is not right — it belongs with “me.” Sometimes sentences start with a phrase that doesn’t belong with anything in the sentence, which can really confuse readers. How to spot one: Anytime you have a sentence that begins with a phrase — an adjective phrase, a prepositional phrase, a participial phrase — make sure that phrase goes with the subject. Fix: Having been provided with iPads, the small staff is expected to have every journalism skill there is. Or: Having received iPads, the small staff is expected to have every journalism skill there is. Fix: ICE releases immigrants caught in Texas on the streets of Arizona. What if it’s not at the beginning? Misplaced modifiers can occur anywhere in a sentence, so read carefully to make sure things are in the right order. 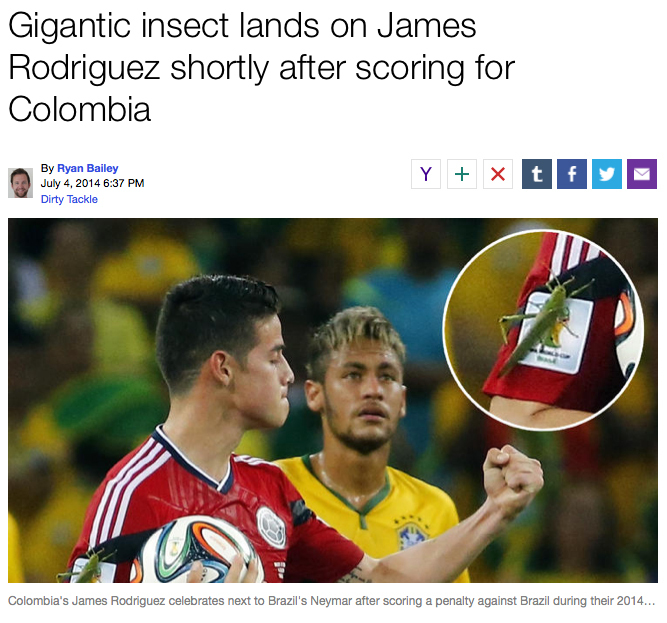 This makes it sound as if the insect scored for Colombia, when (obviously) it was Rodriguez. Here’s another example: The 19-year-old, of Abilene, was killed when his pickup left the road and hit a building while it was being chased by Abilene police. This makes it sound as if the building were being chased, when (obviously) it was the pickup. Again, an easy fix: The 19-year-old Abilene resident was killed when his pickup left the road and hit a building during a police chase. But these kinds of sentences will either slow readers down, even just for a second, while they figure out the meaning, or make them laugh because they don’t say what was intended. Either way, readers are not focusing on the information. When we write to convey information, that information needs to be conveyed as clearly and cleanly as possible. Misplaced modifiers muddy a sentence, so check to make sure everything is in its proper place. I used that same insect example in Terribly Write.